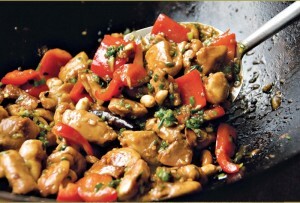 Steamy Kung Pao Chicken recipe by bestchefs at DesiRecipes.com. Combine chicken , egg white and cornstarch in small bowl. Mix next 7 ingredients in another small bowl. Set sauce aside. Heat oil in wok or heavy large skillet over medium-high heat. Add peanuts and chilies and cook until peanuts are golden brown, about 1 minute. Remove with a slotted spoon and set aside. Then in same oil and wok add all vegetables and stir fry for 4 mins.Take all vegetables out of wok and keep aside. Increase heat to high. Add chicken mixture and stir-fry until chicken is lightly browned, about 1 to 2 minutes. Reduce heat to medium. Return peanuts to wok/pan. Add all vegetables too.Add sauce and blend thoroughly. Cook until heated through, about 1 to 1 1/2 minutes. Serve immediately over hot cooked rice, if desired.